Celebrity Extra: Puppy Bowl Is Back! (New York, NY) – Ready for more tail wagging wildness, canine cuteness and animal athleticism than ever witnessed before? On Super Bowl™ Sunday, February 5, from 3-5 PM (ET/PT), Animal Planet’s annual canine competition returns to the grand gridiron with PUPPY BOWL VIII. For the eighth year in a row, with the help of Petfinder.com, Animal Planet has searched shelters and rescue groups across the nation for the toughest pups ever to carry a chew toy into an end zone and across the goal line. Now, the teams have been selected, paws polished and fur combed for the biggest event in animal sports history. This year’s PEDIGREE® Starting Lineup is growling with rowdy rat terriers, defensive dachshunds and charging Chihuahuas, all competing for the title of the BISSELL® MVP (Most Valuable Puppy). But the pups will have to warm up to a new face as PUPPY BOWL VIII marks the debut of Dan Schachner, who takes over as “The Ref” – calling all the plays and penalties on the field. In a game-day first, a piggy pep squad will “ham” it up on the sidelines and squeal with delight for its favorite players while “Meep the Bird” tweets all the fast-paced action. Follow @MeepTheBird on game day for the latest updates, puppy drama and behind-the-scenes moments from inside Animal Planet Stadium. Award-winning animal advocate and television correspondent Jill Rappaport will provide up-to-the-minute sideline analysis and commentary on the game, and fans will be treated to PUPPY BOWL favorites such as the puppy cam, water bowl cam, kiss cam and an aerial view of the field provided by the Ice Breakers® Mints blimp and its hamster pilots. If you’re not the biggest Madonna fan, the cute and cuddly kittens have returned with an all-new edition of the BISSELL® KITTY HALF-TIME SHOW. These adorable felines will treat fans to kitty gymnastics, precious poses and overall kitten craziness leading up to the confetti shower, sending viewers into cuteness overload. All of the animals featured in PUPPY BOWL VIII come from rescues and shelters across the United States. This year’s starting lineup includes puppies from spcaLA (California), All Star Pet Rescue (New Jersey), Go Boxer Rescue (Ohio), Pet Matchmaker Rescue (Pennsylvania), Furever Dachshund Rescue (Rhode Island) and Huts for Mutts Dog Rescue (Texas). Viewers who are interested in adopting a pet in their area can visit Petfinder. To learn more about PUPPY BOWL VIII, fans can visit AnimalPlanet.com for highlights and behind-the-scenes moments from seasons’ pasts and, later this month, a chance to vote for this year’s MVP (Most Valuable Puppy) and an eight-part web series highlighting the history of PUPPY BOWL’s greatest moments. 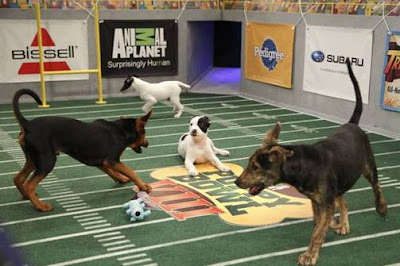 It's great to hear that Animal Planet’s annual canine competition returns to the grand gridiron with PUPPY BOWL VIII. I can't wait to meet all of these amazing dogs.